At 7pm yesterday, the Daily Mirror was predicting a “dismal result for Labour” in the Oldham West and Royton by-election. Winning with a majority of 10,722 or 38.7% was a spectacular result for Labour, for Jim McMahon, for Jeremy Corbyn and, it must be added, for Michael Meacher who had held the seat for 45 years. A majority of 38.7% is the highest majority Labour has ever had in Oldham, and the share of votes at 62.1% is the best ever recorded by Labour. Michael Meacher had the best majority he’d ever had in May with the sole exception of 1997 which was slightly higher. Contrary to some people’s presumption, Oldham is far from being one of the safest Labour towns in the country. Michael Meacher lost the seat at his first attempt – a by-election in 1968, one of a series of by-election losses under Wilson – and then won it in 1970 with a majority of only 5.0%. Although the result in May was very good, it was helped by the personal votes of many people who voted Conservative in council elections for an MP who’d been there for so long, had helped so many people over that time and as well liked. And by the combination of a Lib Dem collapse (down 15.4% to 3.7%) and an even split between UKIP and the Tories. All of which made the result of the by-election so remarkable. Undoubtedly Jim McMahon proved to be a very strong candidate, well-known and well-liked in the town. Although he may not be on the left of the party, he was well liked by Michael Meacher who described him to me as “the best thing that has happened to Oldham Council in a very long time“. The admiration was clearly reciprocated judging by the moving tribute Jim made to Michael following his victory. 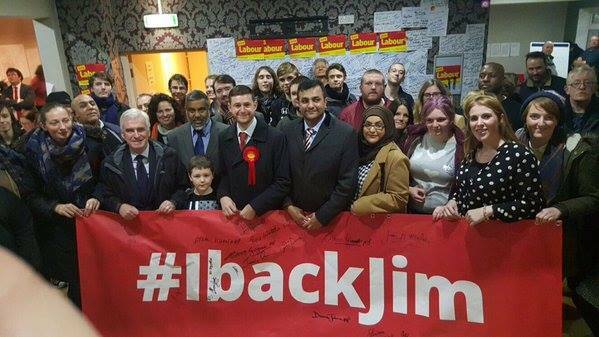 However, the support of the Asian communities in Oldham was also crucial. Though many would have liked to have seen an Asian candidate, the strong turnout and support from these communities was crucial for the result and thanks to the hard work of former NEC member Mohammed Azam who had been the runner-up in the selection contest together with many local councillors. In response to Michael Meacher: what Labour narrative? The Conservative share of the vote fell nearly 10% – very significant. It’s the economy stupid and Britain is split between those who are pro and those who are anti-austerity. There is no room for anything in between which is why the New Labour rump are largely irrelevant despite all the fuss they made about their right to bomb and kill civilians in the name of Cameron’s vanity project. Had anyone of the other four candidates been elected as leader instead of Corbyn Labour’s fate in England and Wales in the 2020 election would have been to follow the Tory-collaborating Lib Dems down the toilet which was Labour’s reward in Scotland for siding with Cameron in the referendum. He was the only one of the five who had any chance whatsoever of bringing Labour back from thirteen years of corrupt government, the loss of two general elections and I fear the permanent loss of Scotland. But even he won’t win if he doesn’t get a lot more radical and put principles ahead of the unity of the PLP because Osborne has already stolen a lot of his policies. Collaborating with Cameron on anything has proved and will prove fatal for the Labour Party and that will include his EU Referendum. As a major critic of the media, even I thought that UKIP from reports would close the gap on Labour, in reality they are nowhere to be seen up only 3%. The media are shattered, they threw everything at Jeremy and he managed not only to win but increased the share of the vote. Troops on the ground is Labour’s greatest advantage, we need to exploit that to it’s maximum, the internet is also vital, getting the message out, modern technology using phone apps etc., are a key logistical tool. by just showing a presence in the centre of town. The NHS is a major draw, we had a sign saying David Cameron is breaking up the NHS piece by piece. The change of vote share between the three main parties (Lab, Con and UKIP) is fascinating. My worry had been that a tactical swing from Con to UKIP might have reduced Labour’s majority severely or even lost us the seat. It looks as though the first part of this was happening ( Con tactical switch to UKIP). How else can the huge drop in the Con vote be explained? Yet this 9.5% drop only resulted in a 2.5% rise in the UKIP vote. Labour’s vote was up by 7.5%. There can only be one explanation for this – that the Labour vote was boosted by a significant return to Labour by previous switchers to UKIP. Good news for Labour, very bad news for the Tories. Otherwise, the result shows that Labour is doing somewhat better than at the General Election, despite not having a long standing and popular incumbent. Although Labour obviously has to do better this by election offers no proof whatsoever that Jeremy Corbyn has caused Labour’s support to fall, if anything the reverse is the case. I hope that those who have so vociferously made these unfounded allegations will now shut up and join the rest of us in building the support Labour needs to win in 2020. While this is strictly a one-off, and by-elections are often looked at with suspicion, nevertheless, perhaps we have seen UKIP’s support peak. To gain only 2.8 per cent in a by-election with the main party in a state of flux can’t exactly be considered a success. There was no obvious signs of tactical voting from the Tories nor defection of the white working class Labour vote to UKIP as the media all suggested, including the oh-so liberal Guardian. I wouldn’t write them off yet, but there’s little for Farage, Nutbar etc to get excited about. It was a huge result for us in so many ways, a fitting tribute to Michael, and a disaster for both the Tories and Ukip. The latter had run a disgraceful campaign that focused on personal attacks and slurs against Jeremy and appeals to racism (the touring Ukip van loudly playing ‘White Christmas’ was no coincidence). It didn’t work, yes the Asian vote was it seems solidly Labour, but the scale of that result went well beyond that and showed that the white working class had not been drawn to a nationalist or racist position even after the anti-Muslim sentiment whipped up by the right-wing press after the Paris attacks. And when compared to what is happening elsewhere in Europe that is a massive and welcome positive. Yes, Jim McMahon is not on the left, but I was impressed by his refusal to say anything negative against Jeremy and he came across as a good unity candidate that the whole Party could and did rally behind. One other thing. Had Ukip won on Thursday I suspect Simon Danzcuk would have defected to them on Friday, something he appears to have been building towards for some time. It will be interesting to see whether the failure of Ukip to get significant white working class support in recent elections will now reign in his public undermining of Labour.